You’ve been looking at homes to buy and think it might be a good idea to find one in need of a little TLC. You’re handy, the place has great bones, and those shows on television make the process look so simple. Whether you are on the market for a home that you can make your own or you’re looking to invest or flip, here are some points to keep in mind before getting fitted for a hard hat. Be Honest – Know what you can do and delegate the rest. If your idea of being handy is hanging pictures that are “almost” level, you might be better off working on the design aspect of the process. You’re spending your own time and money so you can be as adventurous as you want, but at least opt for a professional to do the electrical and plumbing work otherwise you might face very dangerous and expensive learning experiences. Do Your Research – If there is a property that stands out to you and you already know what needs to be done (maybe the kitchen needs new cabinets and appliances and the bathroom needs to be re-tiled) start pricing out project items at local retailers. If you are looking to stay on the lower side of the budget, big box stores may be the way to go. You may also want to view homes with your contractor so he or she can give you an idea of the cost of things you might have overlooked. Make sure you are working with someone you know and trust, or someone reliable who has been recommended by a friend, family member, or trusted third party. Set a Budget – Some people set an all-inclusive budget while others may have a specific purchase price in mind for the property with another amount set aside for labor and materials to fix it up. Remember that surprises happen, sometimes more often than you’d like, so be prepared and set a buffer of 10% to 20% aside in your budget for just that. Know When to Compromise – After setting a budget it’s a good idea to make a list of the things you know you want for the home and another list of the things you can live without. Maybe you’ve always wanted a farmhouse sink in the kitchen and in order to get it, you can compromise on the center island. If you are renovating your own home, do what means the most to you. If it’s an investment property research which improvements could increase the property’s resale value. This article on The Balance’s website entitled The Best Home Improvements to Add Resale Value is a good place to start. Timing is Important, Not Definite – You’ve set a schedule and you want to stick to it, although it may not always be realistic. Whether you’ve bought the home for yourself and are living in the chaos of a remodel or you’ve invested and every month another mortgage payment is chipping away at your proposed profit, any delay can be daunting but it’s something for which you should be prepared. Sometimes the work can take longer than you’d think or maybe something completely out of your control arises like obtaining a license or permit. Either way be sure to set aside extra time and patience because things don’t always go as planned. Renovating a property may not be as simple as it looks on those remodeling shows but if tearing down walls and creating something beautiful is what you love, you should do it. With a little help, a lot of hard work, and some realistic goals, your reno project could rival anything you see on TV. Literally. Do drive-bys, and do them at different times of the day to get a feel for the neighborhood. Is there a soccer field or baseball diamond close by? You’ll want to know before it’s too late whether cars will be lined up on your street every weekend. What’s that nearby intersection like during rush hour? Is there a grocery store close by? The more questions you can answer before moving in, the more confident you’ll feel when it’s time to put down an offer. Thrift stores are a great place to score solid wood furnishings at bargain prices. Even if you don’t end up finding your vintage dream piece, items that look more “grandma” than Mad Men can be transformed with a little paint, varnish, and fresh fixtures. Knowing what you want and why you want it is half the battle, both in life and real estate investing. Before you open your checkbook, search online or call a real estate agent, ask yourself the tough questions of what you want to accomplish, why you want to accomplish it and why you believe investing in real estate is the way to help you achieve it. Do you want to build a portfolio, so you can sell the properties and use the money to fund your retirement? Do you want to buy a property every time you have a child so that 18 years down the road the monthly cash flow or income generated from the sale of the properties can contribute to the cost of their post-secondary education? Do you want to put your skills as a handyman (or woman) to work to fix and flip? Once you know your why, you’re halfway there. After working through this exercise fifteen years ago, Ontarian, Ed, created a plan to fund his retirement. He spent weekends driving through cottage country to choose the location in which he wanted to invest and eventually live. He found a winterized cottage for sale, which he was able to comfortably afford on a fifteen-year mortgage to coincide with the target date of his retirement. He utilized the cottage himself for vacations but also rented it out to generate additional income. Fast forward to the present day and Ed owns the property mortgage-free. However, by renting it out over the years, he was also able to pay for maintenance and updates to the property and invest the extra money to provide cash flow in retirement. With the why, what and time decisions made, next you should set about educating yourself. Establish an informal group of people whose opinions you trust and who have had some success in real estate investing. Some of these people may be in your immediate sphere and others might be experts you listen to on podcasts and follow on Twitter. A Google search for “Canadian real estate investing podcasts 2019” returned more than 16 million results so you should narrow your search by province, city, specialty, etc. to find the best fit for you. Look for people who have “been there, done that” and are creative with a finger on the pulse of investing trends. Aloha! 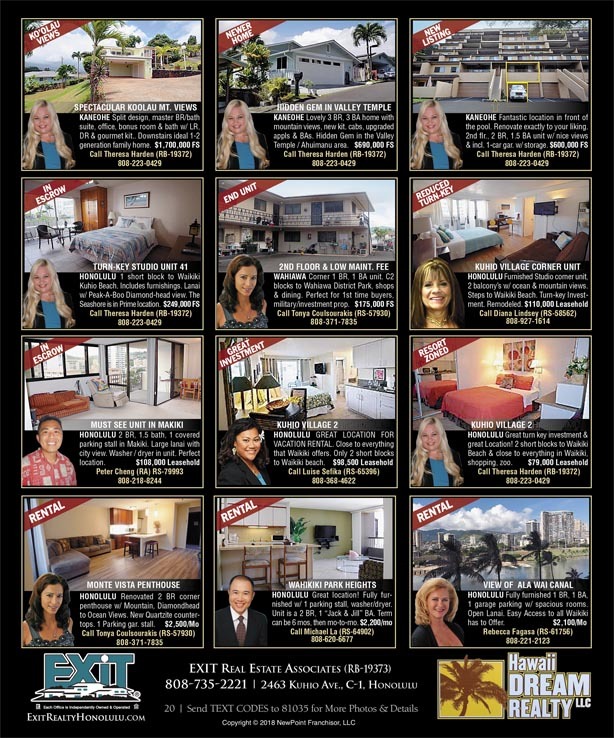 Our advertisement for the February 2019 Estates & Homes publication featuring Oahu real estate listings from EXIT Realty in Hawaii. EXIT Real Estate Associates is proud to have partnered with Homes & Land to market properties for sale. Homes & Lands print media compliments our online sales and marketing provided through our own ExitRealtyHonolulu.com website in addition to Realtor.com, Trulia, Zillow, and other third party listing providers. In addition, our listings can be found on The Wall Street Journal real estate portal, The Washington Post real estate portal, The New York Times and The International New York Times real estate portals as well as other established luxury lifestyle real estate portals. With Homes & Land our listings get exposure with more than 2,700 targeted, quality publications mailed to Oahu homes; direct distribution to industry professionals including mortgage companies, title companies, banks, coffee houses, and real estate offices; and reaches over 190 MILLION unique visitors worldwide through Internet marketing campaigns and online syndication that target Asia, Europe, Japan, India, Canada and Latin America. You can find our advertisements on the back cover in the current issue as well as past issues. Contact your Realtor if you have any questions about any of the properties appearing in any issue of the Estates & Homes publication. EXIT Real Estate Associates specialized in sales, marketing, exchange, and management of investment properties. For more information on our services visit www.ExitRealtyHonolulu.com or for more information on our short term rental properties visit www.WaikikiStay.com. 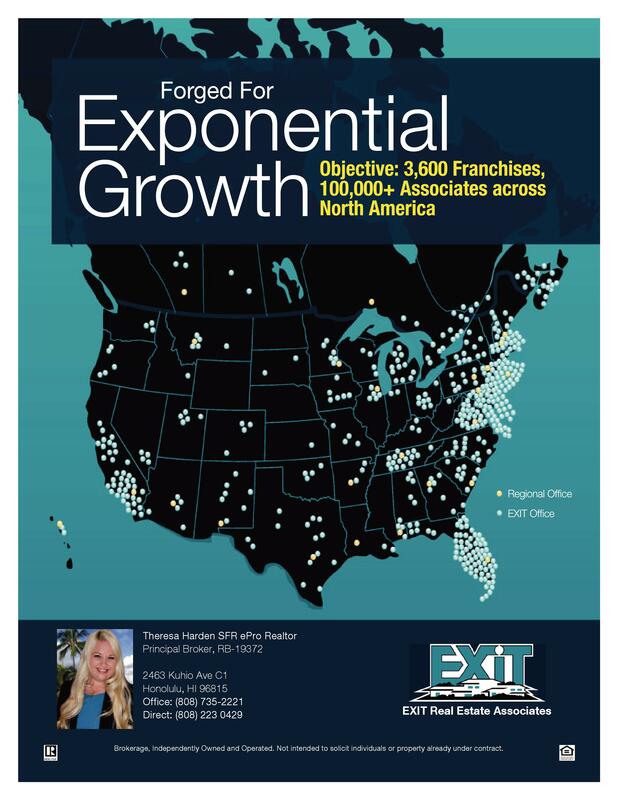 EXIT Real Estate Associates is an independently owner and operated EXIT Realty Corp International franchise. The December 2018 Mortgage Bankers Association rate forecast for the 30 year fixed rate mortgage has us ending with a slightly lower forecasted rate for this final quarter of 2018 than previously forecasted. Even the quarterly forecasted rates moving through 2019 have been slightly revised downward from the previous forecast. The forecast is predicting more marginal rate growth in 2019 plateauing around 5.0 percent while the forecast holds steady at only 5.1 percent for all quarters in 2021. Looking back to the 2017 forecast predictions one year earlier, the forecasted average quarterly rate was actually higher than the average quarterly rate we have today suggesting that the anticipated rate increases have curtailed during the past 12 months but not by a significant margin. None-the-less, the rates are still forecast to meander upward slowly at least through 2019. Expect fluctuations in the rate as the 30-year fixed rate mortgage as we kick off 2019 with the more aggressive rate rise during the early part of the year. Depending on market demand, the mortgage rates can pave the way for an increase in home values as mortgage rates remain relatively stable with not much deviation in the quarters ahead. The flip side is that when the real estate market becomes stagnant, buyers are not as pressured by rising mortgage interest rates to make a purchase. However keep in mind that according to Freddie Mac’s September 2017 outlook report, total home sales are expected to rise with a 4.9 percent increase in home prices in 2018. Complacent buyers may get out priced if the real estate market continues its record level upward trend. Check out how much your home is worth based on local home values in your neighborhood. Simply enter your address and see what is available in your neighborhood. See available Just Listed Honolulu, Hawaii homes that are for sale right now. So what do these rates mean if you are seeking a Veteran’s Assistance or VA home loan? The rates one actually qualifies is based on several factors including the loan program, credit score and credit worthiness. The forecast rates are only intended to provide you with insight into what the market considers as the overall average rate for the given period. You must check with your financial institution to find out what rate you qualify and in some cases that rate may be lower than what you see forecast by Mortgage Bankers Association. VA home loan is a home loan guaranty program offered to Veterans, military service members and eligible surviving spouses. Aloha! Our advertisement for the December 2018 Estates & Homes publication featuring Oahu real estate listings from EXIT Realty in Hawaii. EXIT Real Estate Associates is proud to have partnered with Homes & Land to market properties for sale. Homes & Lands print media compliments our online sales and marketing provided through our own ExitRealtyHonolulu.com website in addition to Realtor.com, Trulia, Zillow, and other third party listing providers. In addition, our listings can be found on The Wall Street Journal real estate portal, The Washington Post real estate portal, The New York Times and The International New York Times real estate portals as well as other established luxury lifestyle real estate portals. The November 2018 Mortgage Bankers Association rate forecast for the 30 year fixed rate mortgage is unchanged from the previous month with a gradual increase throughout 2018. The average interest rate is still forecast to plateau at 5.1 percent by the end of June 2019 and then hold a steady average through the remainder of 2019 and even through 2020. Expect fluctuations in the rate as the 30-year fixed rate mortgage will not remain stagnant but will slightly deviate around a 5.1 percent quarterly average. To gain some confidence in the forecast, we looked back to the 2017 forecast predictions one year earlier. The forecast average quarterly rate was 4.9 percent which is consistent with today’s forecast rate for the same period. One year ago the forecast prediction for the 2018 annual average rate was 4.7 percent increasing to 5.2 percent in 2019. The current forecast has surpassed the 4.7 percent annual average rate for 2018 however the 2019 annual forecast was a notch higher at 5.2 percent. A comparison of the two forecast periods supports a continual rise in the average mortgage rate at a much less aggressive rate than we have experienced thus far for 2018. Depending on market demand, the mortgage rates can pave the way for an increase in home values as mortgage rates remain relatively stable and even flat for a prolonged periods of time in the quarters ahead. The flip side is that when the real estate market becomes stagnant, buyers are not as pressured by rising mortgage interest rates to make a purchase. However keep in mind that according to Freddie Mac’s September 2017 outlook report, total home sales are expected to rise with a 4.9 percent increase in home prices in 2018. Complacent buyers may get out priced if the real estate market continues its record level upward trend. GREAT LOCATION FOR VACATION RENTAL. Close to everything that Waikiki offers. Only 2 short blocks to the gorgeous Waikiki beach. Whether you are looking for someone to take the burden of the daily demands of managing the property and the tenants, or looking for someone to make sure you are in compliance with Landlord Tenant Code, Hawaii Dream Realty LLC has a TEAM of ethical, licensed, professionals to get the job done while making your investment as profitable as possible. EXIT Realty Corp. International’s charitable pledges to-date now total $4 million. In addition, EXIT announced an expansion to our successful charitable initiative, newly dubbed The Spirit of EXIT Dollar-for-Dollar Matching Program. A portion of every transaction fee received by EXIT Realty Corp. International is pledged to charity. In 2004, we began a long and successful affiliation with Habitat for Humanity when we sponsored the first of many home builds. In 2016, we introduced a program to match funds raised by brokerages and agents to benefit Habitat for Humanity initiatives in your local communities. The new Spirit of EXIT Dollar-for-Dollar Matching Program makes it possible for EXIT Associates to raise funds for not only Habitat for Humanity initiatives but also for other approved, registered charities and submit a proposal to EXIT Realty Corp. International for those funds to be matched dollar-for-dollar from EXIT Realty’s pledged pool of funds. EXIT Real Estate Associates is committed to preserving the ‘aina and Hawaiian values as well as the importance of spirituality in our everyday lives. Our company has worked hard with the Kuhio Village and neighboring communities to spread the spirit of aloha and provide for a positive and rewarding experience for all our guest, customers and clients. The blessing of Kuhio Village by Kumu Karen Leialoha Carroll and her father was greatly appreciated by Theresa Harden, Principal Broker, and her Staff, as well as the residents of Kuhio Village. 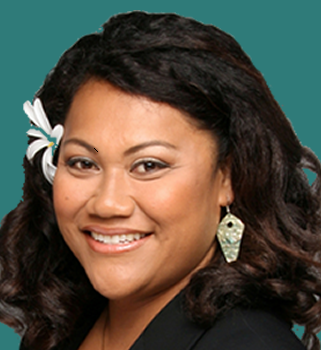 Kumu Carroll provides inner peace and guidance through her words of wisdom, her spiritual chants and prayer. 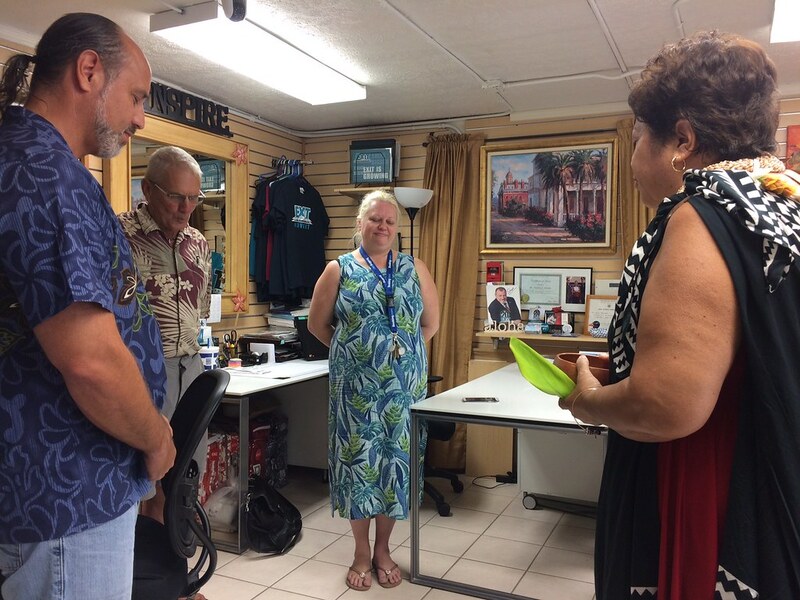 Mahalo nui loa to Kumu Karen Leialoha Carroll and her father for creating an unforgettable moment and connecting us with our community. Click on the photo to open the flickr album of pictures taken during the blessing of Kuhio Village on April 21, 2017. The blessing begins with the EXIT Real Estate Associates office and progresses through the lobby area and grounds of Kuhio Village. Below is an excerpt by Tami Bonnell, CEO of EXIT Realty Corp International, that we wanted to share with you from Volume 4, Issue 3 of the EXIT ACHIEVER. Click Here for the latest edition. The unique culture and empathy orientation that we cultivate through our EXIT Formula of residuals and our commitment to mentorship naturally fosters a family atmosphere within our corporate office all the way through to each and every one of our offices across North America. There’s a sense of belonging, a willingness to share and to lift one another up. Similar to a family, we share more than just a name, but a common goal and a unified focus on the significance of the human element. People produce more in a family environment where they feel safe, cared for and trusted. And in real estate this equates to agents not only feeling at home, but also their clients in turn as well. Simply by giving as many people as possible the atmosphere they need, we will continue to grow and prosper. So as you look forward into a New Year full of possibility, focus on prioritizing individuals to create your legacy. Do it one person at a time, by making their life and their business important and you will achieve the success you are looking for. To learn more about your local Honolulu EXIT Realty ohana, contact Theresa Harden (R) PB via phone at 808-223-0429 or email th@808exit.com. We are pleased to reveal our newly designed vacation rental marketplace website for Hawaii Dream Realty LLC, feel free to Take a Peek! We have worked hard to grow Hawaii Dream Realty LLC from a single dimension real estate brokerage operation to a franchised company more robustly able to provide for our Client’s real estate needs. The company utilizes enterprise systems for each of its business lines with the goal to maximize returns, increase property value, reduce risk and stress, save time and money, and ultimately to provide piece of mind to our Clients. The company already employed proprietary systems for marketing and managing real estate transactions through our affiliation with EXIT Realty Corp International. Hawaii Dream Realty LLC, doing business as EXIT Real Estate Services, specializes in the procurement and exchange of investment properties. Today, Hawaii Dream Realty LLC is comprised of a number of business lines that have been developed in direct response to the needs of our Clients. Together they provide our Clients with a total real estate investment solution. For the first time we have dedicated websites and back office support systems that reflects each service line. The vacation rental marketplace is the consumer end of an enterprise system that expands the ability for Hawaii Dream Realty LLC to manage and market our Client’s investment properties zoned for short term accommodations. Our new website, aside from being aesthetically pleasing, provides an agile and easy to scan, read, and navigate interface for its users enabling visitors to find their accommodation wants quickly. One of our primary objectives we wanted to achieve when designing the new site was to help visitors get to know us better and get a feel for who we are as a company and vacation services host. We employed a responsive, security-conscience design, which means that you’ll see essentially the same design and secure interface optimized for your smart phone, tablet or desktop. We hope you will visit the new website at our new address, www.waikikistay.com and acquaint yourself with the many options we offer when it comes to vacation rental properties for Waikiki. The company has its office located in the heart of Waikiki on the beautiful Hawaiian Island of Oahu. The vacation rental accommodations are within a three block radius of the office and have immediate access to everything that is Waikiki from its dining, street entertainment, to its beautiful beaches and parks, and even a zoo and an aquarium. We are quite proud of the site, but we know there is still work to do. In the coming months, we plan to continue to expand our online marketing to additional third party vendor sites increasing the online exposure of our Client’s properties. Craig Venezia is writer for the San Francisco Chronicle and author of Buying a Second Home: Income, Getaway or Retirement. On March 6, 2015, Craig published “The Dollars and Sense of Buying a Vacation Home” and provides some insight into what it means to own a vacation home. As with any investment be sure to do your due diligence and understand the implications of the investment as they apply to the state in which the property exists. According to the National Association of Realtors, Americans bought 717,000 vacation homes in 2013. If you’re considering taking the plunge, take time to figure out what a vacation home purchase would really cost you. Otherwise, you may find that owning one is no holiday. You’ll, of course, need homeowner’s insurance and you may have to buy flood or earthquake insurance. A property management company fee can vary depending on the level of services. The management firm can also help you find short term guests or long term renters if you want; expect to pay upwards of 20 percent or more on the daily rent you take in. Some cities and counties impose such taxes, too; they may go by other names, such as lodging,accommodations, hotel, bed, tourist or transient occupancy taxes. Be sure to find out whether you’d owe them so you’re not hit with a nasty surprise after you become a vacation-home owner. In Hawaii, all property owners are required to pay property taxes. If the property is rented, long term rental income (greater than six month lease) is also subject to General Excise Tax. While short term (vacation) rentals are subject to both General Excise Tax and Transient Accommodations Tax. As with all Hawaii income, the income is subject to income tax. But wait there’s more, Hawaii may impose other taxes when it comes time to sell the property. For more information on taxes, you should consult a local accountant. Bottom line, even with the management fees, insurance, and taxes, the right deal combined with the right management company, over time, can get you positive return on your real property investment. Just be sure to do your due diligence. The December 2014 Booming Rental Income Newsletter includes articles on “How to Set the Right Rent” and “Booming Rental Income” by Dr. Lawrence Yun, the Chief Economist for the National Association of Realtors. Click on image to download your copy of the newsletter. We are an independently owned and operated EXIT Realty Corp. International real estate company serving the greater Oahu area. Our office is located on the ground floor of the Kuhio Village condo-hotel complex. We are in a unique position to advise you on Honolulu’s short term vacation rental market as well as its long term rental market. We use investment case study calculators to project investment cash flow, cap rate, and rate of return on perspective investment properties. The Booming Rental Income Newsletter shares techniques and resources to consider when assessing a fair market rent for your investment. In this newsletter also read about why Dr. Lawrence Yun, the National Association of Realtors Chief Economist expects rents to continue to increase and even double in the next 20 years. For more information on our real estate investment services visit www.WaikikiWalkingTours.com. An appraiser is a professional person who provides an objective report on the estimate of value of real estate. An appraisers opinion of value is very important as the appraiser must prove to the bank that a property is with equal or more than the loan the buyer is trying to obtain. Real Estate Advisor is an informative newsletter offered to Clients and Customers covering all aspects and facets of the real estate industry. This edition of the newsletter discusses the importance of an appraisal. Click on image to download your copy of Real Estate Advisor. With that said, below is a MarketWatch article by Daniel Goldstein that dispels some myths associated with real estate appraisers and is appropriately titled “10 things real estate appraisers won’t tell you” published on November 22, 2014. As a reaction to such allegations, the Dodd-Frank Wall Street Reform and Protection Act of 2010 required more state and federal supervision of appraisers, and put more pressure on lenders to work through appraisal management companies, or AMCs. These independent firms are designed to keep appraisers and lenders from getting too cozy, explains Sam Heskel, manager of appraisal firm Nadlan Valuation in Brooklyn, N.Y. But appraisers say that new rules have made the process slower and more complicated for consumers—and that they haven’t stopped some appraisers from yielding to pressure from banks. One unintended consequence of the Dodd-Frank reforms: AMCs are increasingly sending out-of-county or out-of-state appraisers to calculate property values. This happens because AMCs in some cases assign homes to appraisers essentially at random, says Huff: “They may not know the area all that well, and not use the right [comparisons],” says Huff. This matters because inaccurate appraisals can hurt consumers. An appraisal that undervalues a property may keep a seller from getting a fair price; one that’s too high could put a mortgage out of reach for a buyer. The typical appraisal costs between $350 and $500, according to Zillow, and it’s paid for by the consumer (usually the buyer). But while home inspectors, real-estate agents and contractors technically work for the consumer, the appraiser’s work is owned by the bank. And in some cases, homeowners and buyers are adversely affected by appraisals they never personally see. Consumers do have recourse: Federal law requires that a copy of any appraisal be given to consumers who request it in writing. And unlike inspectors or agents, home appraisers have to answer to Uncle Sam, which means dissatisfied customers can complain to the feds. Complaints about appraisers and their practices can be filed with the Appraisal Subcommittee, which is part of the Federal Financial Institutions Examination Council. During the housing bust, many banks tried to resell homes they’d foreclosed on—only to find that their real value was far lower than the appraiser’s report had suggested. “The home wasn’t in the condition the appraiser said it was, and sometimes the home wasn’t even there,” says Greg Schroeder, president of Comergence Compliance Monitoring, a Mission Viejo, Calif., appraisal-technology company. When an appraiser’s decision jeopardizes a deal, consumers are likely to feel aggrieved. Since the housing bubble, appraisers have typically gotten the most heat is over their work in neighborhoods with many distressed properties—since distressed sales and foreclosures create a baseline of comparable home sales (or “comps”) that tends to drive down prices. The Appraisal Institute, an industry trade group based in Chicago, says that such situations aren’t uncommon, and it encourages consumers to get a second opinion. But some real estate pros advise consumers to get a valuation estimate of their own, even before the appraiser shows up. Buyers and sellers can ask their real-estate agents to provide a broker’s price opinion: Those estimates themselves may not always be accepted by lenders, but they can give the borrower a baseline from which to judge an official appraisal’s accuracy. Heskel advises that buyers get at least two opinions, even if they’re paying cash. Differences in estimates can knock $10,000 to $20,000 off the final sale price of a home, he says. In many states, it takes relatively little training to qualify as a home inspector or real-estate agent. But for appraisers, the requirements can be very high—in large part because would-be appraisers have to be in compliance with both state and federal guidelines. Simply becoming a trainee requires 75 hours of classroom time, according to the Appraisal Institute. To become a licensed residential appraiser (which only allows the appraiser to examine homes that have a value of $1 million or less) is another 150 hours of classroom time involving finance topics, valuation and market analysis. Qualifying as a certified residential appraiser, one of the highest levels, takes another 210 hours. Moreover, any appraiser that works with a federal agency must be certified on what’s known as a National Registry, which has more requirements. And typically, appraisers have four-year college degrees, or even postgraduate education. In 2010, there were 90,000 appraisers in the U.S. By last June, that figure had shrunk more than 10%, according to the Appraisal Institute, which says its ranks are thinning due to retirements and fewer people entering the profession. Today, more than half of appraisers are between 51 and 65 years old. And less than a third of all appraisers work in the residential sector, the institute says. One issue is that hiring in the field has generally slowed down. In a 2013 Appraisal Institute survey, just 9% of residential appraiser firms and 21% of commercial real estate appraisal companies said they planned to hire more trainees. When they do hire, some hope they’ll keep diversity in mind. About 90% of the 80,000 appraisers in the business are white and just over a quarter are female. The institute has formed a diversity committee to provide scholarships and training for minority appraisers. Some homeowners assume that spending $50,000 on, say, a fancy new kitchen will raise the value of their house by $50,000. But that’s seldom the case: Ambitious home-improvement projects “are often not worth the price in a resale situation,” says Lance Coyle, incoming president of the Appraisal Institute. Which renovations are more likely to raise a home’s value? A fresh coat of paint in neutral colors, or new fixtures or trim boards, can add value the fastest, Coyle says, as can Energy Star-compliant “green” renovations that pay the homeowner back in lower utility bills. Some homeowners confuse the roles of home inspectors (who assess the physical condition of a home) and appraisers (who estimate its sale value). One key way in which they differ: While many inspectors want consumers to follow them around—so they aren’t shocked when they’re presented with a multi-page fix-it list—experts say there’s no benefit for the owner or buyer in tagging along with the appraiser. But technology is speeding up the process. “Big Data” software has eased the gathering of real estate information, while tools like Google Earth are figuring in more appraisers’ research. Even drones could soon come into play, if regulators allow their commercial use. “I don’t think there’s a replacement for boots on the ground, but the precise way a piece of collateral information is collected will change,” Huff says. Your local EXIT Realty Ohana joined real estate professionals from across North America recently at the EXIT Realty International Convention and Gala at the Disneyland Resort in Anaheim, California. This convention is an annual, 5-star, event that brings top real estate professionals together to interact and learn from each other and promote discussions about issues and trends in the real estate market. A high point of the event was the Gala presided over by EXIT Realty Corp. International Chairman, Steve Morris. 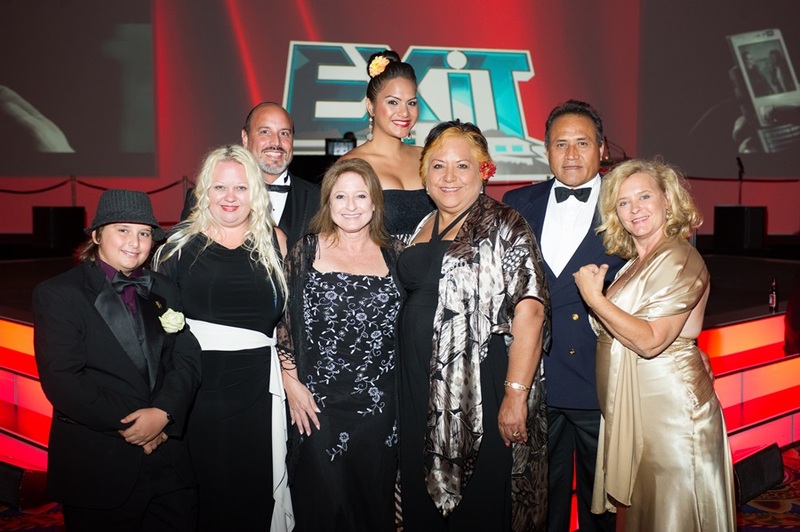 ANAHEIM CA (October 2, 2014) From left to right: Kaikoa Couture, Theresa Harden (R), Allen Couture, Julie Smith, Laulalani Crawford, Vhonda Lehue Crawford (R), John Fagasa, Rebecca Fagassa (RA), at the 2014 EXIT Realty Corp International Gala. ANAHEIM CA (September 30, 2014) EXIT’s 16th Annual Convention was a giant celebration in beautiful California. While exact attendance is not known, the event was packed with professionals taking up the entire first level of the Fantasy Tower of the Disneyland Hotel! 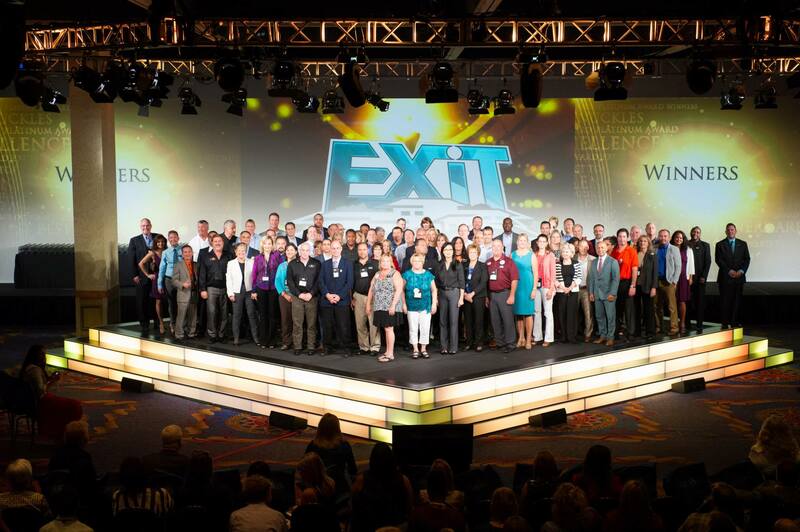 Congratulations to all of EXIT 2014 Award Winners and we are looking forward to next year’s EXTRAVAGANZA at historic Nashville, Tennessee. EXIT Realty is a proven real estate business model that supplies single-level residual income – for agents, security, stability and direction; for agents’ families, security in the form of beneficiary and retirement residuals. EXIT’s MIND-SET Training Systems offer the industry’s best hands-on, interactive sales training. State-of-the-art technology, including the Digital Marketing Strategy, gives EXIT Realty agents the edge in a competitive marketplace. EXIT is a by-invitation-only company focusing on the business of real estate. A portion of every transaction fee collected by EXIT International is applied to its charitable fund. To-date, over $2 Million has been pledged to Habitat for Humanity. The complete EXIT Promo Shop suite includes online, email and direct mail marketing tools. I have a story to share with you that unfolded this past weekend while I was preparing a “Labor Day Greeting“. I used EXIT’s Promo Shop services to create the greeting. While using Promo Shop I came across a “Forged for Exponential Growth 2014” flyer which caught my eye. Now this is where this story begins but first I want to give you a little more background. Like past years, we are gearing up for the Annual EXIT Realty Convention. This year is the 16th extravaganza of its kind and is hosted at the Disneyland Resort in Anaheim, California. In preparation for the event, our associates needed to order more business cards. For the back of the business card, we wanted a custom graphic and one that focused on EXIT in Hawaii. After several drafts, its was decided to portray our Hawaii EXIT Residual Thermometer as a line graph and when we did we found that the curve resembled an exponential curve. 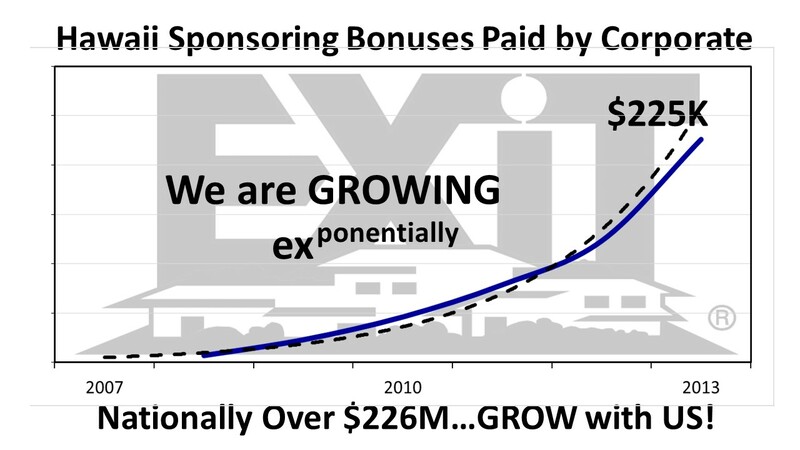 Over $226 MILLION PAID OUT in Sponsoring Bonuses since 2013 by EXIT Realty Corp International. PAID OUT on Top of Commissions! We then got a little creative and provided a graphic with a timeline depicting how much EXIT Realty Corp International has paid out in sponsoring residuals generated from Hawaii EXIT brokerages. The graphic was approved and off it went to print. There are a couple of things that make this graphic special to EXIT in Hawaii but not unique to EXIT. First the timeline depicting when the first EXIT office opened in Hawaii in 2008. The first office was converted from a then independent Kaneohe real estate brokerage referred to as Hawaii Dream Realty LLC. Hawaii Dream Realty LLC was founded on the same principals shared with EXIT Realty Corp International in that the agents are the true assets of the brokerage and the EXIT Formula had a special and unique way of making that happen. You could say I attracted EXIT Realty Corp International to me and I have been grateful ever since. So that brings us back to today where Hawaii Dream Realty LLC is doing business as EXIT Real Estate Associates. Through the years and transformations of the Kaneohe brokerage, EXIT Realty Corp International paid out hundreds of thousands of dollars in sponsoring bonuses and beneficiary bonuses right back to its associates and members in Hawaii. Over $225 THOUSAND – Hawaii Sponsoring Bonuses Paid by Corporate! Could you do something with that? Now the entire process of creating the original graphic for the back of the business cards took several days, during which time much thought went into what to present and how to present it. At no point was EXIT Promo Shop explored for ideas and up until today the idea was considered original. But what had really occurred was that the information being sought already existed. It was through the power of thought that the details wanted became known. Now there are slight nuances between the use of exponential in the flyer and in the business card graphic but the use of exponential in both pieces affirms that we can attract that what we want. Some have referred to this ability as “The Secret” but it is something that I believe we all truly possess and I am thrilled to be able to share this example with you.